What Are Your Rare Coins Really Worth? I bet you have some old coins you’ve collected, bought or been given stored somewhere in your home or in a safe deposit box. Are they valuable? You’ll never know what they are worth, until you ask ASI to evaluate them for free. The outcome of your free coin evaluation will either be good news, or it won’t be the value you hoped for. add rare coins to your existing portfolio. Remember, if you knew nothing about the stock market, you wouldn't choose your own securities. You’d trust the experts. ASI works with the experts. Our Rare Coin Program is a rock-solid, trustworthy program you won’t find anywhere else - and is one of the most popular with our clients. Our Rare Coin Program offers you handpicked coins by Douglas Winter, considered the world's leading expert on pre-1933 rare U.S. gold coins. Doug, the author of 13 books on the subject, has much more than just knowledge of coins. Doug also knows first-hand what collectors want; and collector behavior affects the value of rare coins. Doug is intimately familiar with investor demand and psychology. The Rare Coin Program has grown so rapidly, that in some cases, we are the marketplace, and we have the clout to protect our clients’ portfolios. 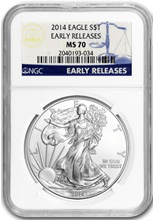 Here is a hand-selected coin Doug suggests should be added to any new or existing portfolio. 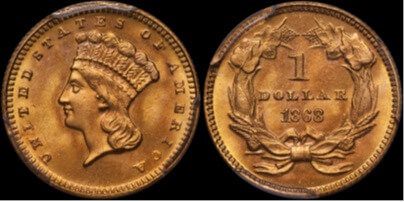 Regular issue American coins began production in 1793 when half cents and cents were produced. Silver coin production began in 1794 with the introduction of three denominations: the half dime, half dollar and silver dollar. Of these three, the half dime is the most available and it is by far the most affordable. There are an estimated 500-700 1794 half dimes in existence, in grades ranging from Poor to Gem Uncirculated. This issue did see circulation, but because of its small intrinsic value, more first-year souvenirs were saved than with the larger denomination coins. 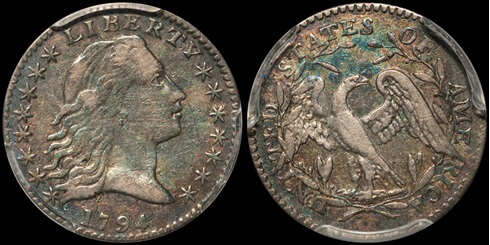 Today, 1794 half dimes are highly collectible, and they are popular with die variety specialists, half dime collectors, first-year-of-issue collectors and type collectors as well. This lovely PCGS VF35 example is well detailed and it shows lovely deep multi-colored toning on the obverse and the reverse. It is very hard to find a 1794 half dime with this attractive coloration, especially in the popular VF-EF grade range. PCGS has graded seven examples in VF35 with 119 higher. This is the only VF35 1794 half dime to have been approved by CAC. It is impressive to think that this charismatic little coin, in above average condition and with CAC approval, can still be obtained for less than $10,000. A 1794 silver dollar in comparable condition is worth well over $250,000. Traditional investment markets can be quite volatile; but, rare coins are not impacted by 99% of the factors that affect other investments. Rare investment-grade coins with collector demand have a proven performance history. The PCGS3000 Index shows an average increase of 248% over the last 10 years and an average gain of 11% per year over the past 40 years. The above MS67 1868 $1 Gold is an extremely low mintage, pre-1933 coin. It is beautiful and difficult to find. In fact, there is only one other known coin finer in this grade. The ‘T.V. infomercial special’ MS70 Silver Eagles are essentially worth the price of their silver content. They are marketed as an affordable collectible with tremendous upside. Given there are over 200,000 of these MS70 Silver Eagles, I doubt that tremendous upside will materialize. Don’t let the non-performance of the wrong coins stop you from investing in rare coins in the future. Call me for your free coin evaluation and to discuss strategies on how to start a Rare Coin Program portfolio. After your free coin evaluation, no matter the value of your coins, you have the opportunity to start, or add to, a truly rare coin portfolio. View our selection of featured coins here. Call me, or one of ASI’s Preferred Client Relations representatives, and we'll arrange a free coin evaluation. Most importantly, we will keep you in the rare coin arena. So clean out your desk drawer and safe deposit box. Call ASI or send me an email to schedule your free coin evaluation and get started on your Rare Coin Program portfolio. *Prices are subject to change based upon product availability and market fluctuation.